Can you believe the holidays are here already? Yep! Thanksgiving is in two weeks and Christmas is in 45 days. ? That actually freaks me out a little, as it feels like it was yesterday and I was disposing of my Christmas tree. But then I remember all the yummy food that we get to shamelessly eat around this time, like this lip-smacking delicious Blueberry Glazed Ham, and I get all jittery and excited. Who can resist the holiday magic? In Brazil, we usually eat glazed ham for Christmas, but here in the U.S. I often see it on Thanksgiving and Easter tables. I mean, not that I need a specific holiday to eat ham, but I’m a sucker for beautiful traditions, so a succulent juicy smoked glazed ham is definitely making it to my holiday table this year. Except, I’m raising the bar this time and using blueberries for my glaze. ? The blueberry glaze really takes this ham to a whole new level. I know whatcha thinking. Blueberries in a savory dish? And my answer is: Hell yeaaaah! The blueberry glaze is not overly sweet and gives a nice tang to this dish that will have your guests licking the plate clean. I think that after the success of this Blueberry Glazed Ham, I am ready to venture into new, unsailed seas. I’m thinking salads, pizza, a sauce over polenta, stuffings for Thanksgiving… Heck, I’m even thinking omelette! What do you think? Yay or nay? Blueberries are so fun and versatile that there are no limits to what you could do with them! I used frozen blueberries for convenience, but you could totally go with fresh here! Did you know blueberries are available year round, both in the frozen and fresh produce sections? And if you’ll allow me to get a little nerdy here, I’ll tell you that not only they are versatile, but also really good for you. Blueberries are an excellent source of Vitamin C (necessary for growth and development of tissues and great for wound healing) and high in manganese (which helps the body process cholesterol and nutrients such as carbs and protein!). They are also a good source of dietary fiber, are low in fat and sodium and have just 80 calories per cup! Yep, friends. I think we could all use some more blueberries in our lives. I keep a bag in my freezer and always add them to my smoothies! This recipe makes a good amount of glaze. I like to have extra so people can smother their ham slices into some more blueberry sauce! Go big or go home, right? And as you can see in my pictures, I used a boneless fully cooked smoked ham! I like how practical they are and love the smoked flavor combined with this glaze. However, feel free to use this glaze in your preferred type of ham (or even chicken, salmon or turkey!). I used to love getting the big piece of smoked ham that is already sliced, because I love how the glaze gets inside the slices, caramelizing everything it touches. But I don’t see them as often anymore, at least not at my local grocery store. Maybe they’ll start appearing closer to Thanksgiving, who knows… Anyway, I have no problem slicing my own ham. It is just as delicious! Oh and you know what else is super delicious? The sandwiches you’ll be making with the leftovers. I mean… if you have any leftovers. Also, don’t forget to enter the U.S. Blueberry Council’s sweepstakes for a chance to win $500. Good luck! Whoa! I’ve put blueberries on mahi mahi before but ham? This is incredible, Olivia! I love the beautiful splash of color they add! Such a creative dish! Perfect for the holidays! Love that you used blueberries! The holidays are so close! I know! I’m freaking out! Where did the year go?? :-0 :-0 Thanks for commenting, dear. 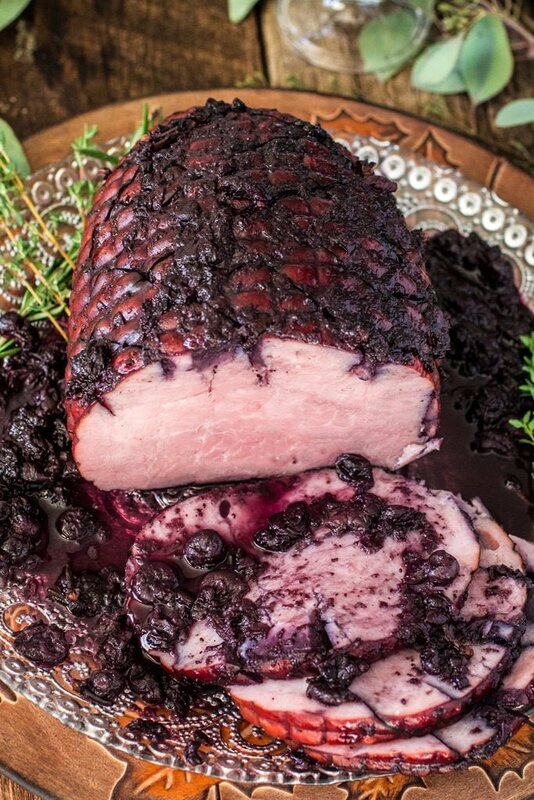 This ham looks extra juicy and succulent with the blueberry glaze! Absolutely delicious!